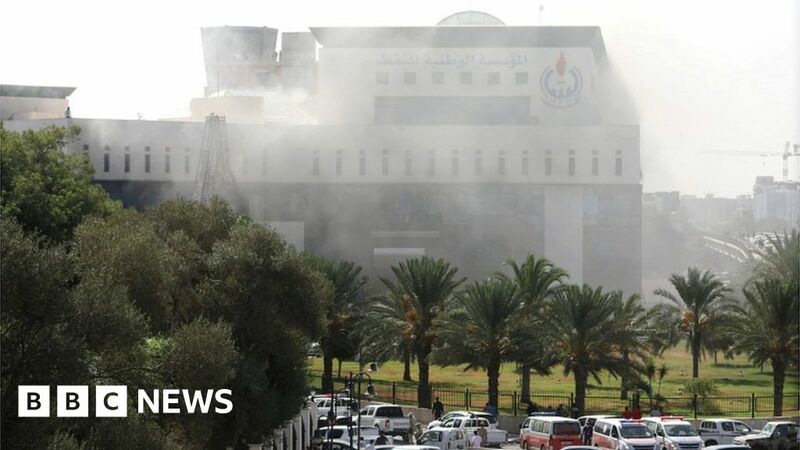 An armed group has stormed the Tripoli headquarters of the National Oil Corporation (NOC) in Libya. Security forces clashed with the armed men at the landmark building in the centre of the city, and blasts and gunfire could be heard, witnesses say. Libya’s oil sector, which is central to the economy, has been repeatedly disrupted by violence since long-time ruler Muammar Gaddafi was ousted in 2011. Earlier this month, there were clashes between rival armed groups, and Tripoli has also seen occasional militant attacks. The recent violence has forced thousands of people to flee to nearby towns or seek shelter in other parts of the capital, while many more remain trapped inside their homes. In May, the Islamic State group claimed a deadly attack on the national election commission offices in the capital. This attack will send shockwaves throughout Libya; not because it was unexpected, but rather for what it symbolises. The NOC represents the core of what has kept Libya afloat over the last seven years of anarchic rule and prevented it from being branded as a failed state – it is the state’s money-maker. The National Oil Corporation in Tripoli is the only internationally recognized oil body – they have consistently been the only institution that is in control of global oil sales from the conflict-ridden country. But like other government institutions, it has not been immune from the divisive, internal regional politics that has come to define Libya over the years. It too has a parallel – but paralysed – rival in the East of the country. However, the head of the NOC, Mustafa Sanalla, who was rescued in today’s attack, managed to find allies in armed groups where even the government has failed. His relationship with East Libya’s armed forces, which has had its ups and downs, has largely allowed the NOC to keep the oil and gas flowing from most parts of Libya despite the chaos and insecurities.